Utah's Wasatch and Uinta Mountains are known for abundant light powder snow and relatively easy access to the backcountry. Untracked powder entices many people to hike from trailheads into the areas outside ski resort boundaries. Within the ski areas, ski patrollers monitor slope conditions, hazards, and weather. When skiers and boarders choose to go into the backcountry, they need to be constantly aware of their surroundings and make safe decisions for themselves. With a growing number of people recreating in the mountains of Utah, and their steep snowy slopes, backcountry avalanche accidents are happening more frequently. A person’s best chance of surviving being buried by an avalanche is a speedy rescue from within the victim’s group. Hopefully, each member of the party is wearing an avalanche transceiver, has rescue equipment, and the knowledge to act quickly. Quite often, unfortunately, this is not the case. When someone is caught in an avalanche or disappears in avalanche terrain, professional rescuers from many ski resorts in the Wasatch must step up to rescue them. Wasatch Backcountry Rescue (WBR) is a non-profit Utah corporation, incorporated in 1977 to provide life-saving rescue and recovery services to the general public. 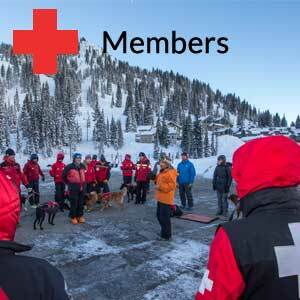 Members of WBR include teams from professional ski patrols throughout the Wasatch. Volunteers from Snowbird, Alta, Solitude, Brighton, Snowbasin, Park City Mountain Resort, Canyons, Deer Valley, Utah Department of Transportation, and the Wasatch Powderbird guides all train, test and respond to accidents together. The typical avalanche rescue is initiated by a 9-1-1 telephone call. Dispatchers contact the County Sheriff, who then calls WBR personnel. Rescue teams respond to the avalanche site using trained search and rescue dogs. Avalanche sites are usually accessible to WBR volunteers only by skis, and the weather conditions are often dangerous and severe. 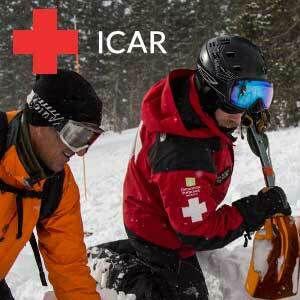 The most critical aspect of a safe rescue and recovery of an avalanche victim is time. Dog teams enable us to locate, recover and evacuate victims quickly. Dog teams also reduce the number of personnel exposed to further hazard. One canine team can do the job of more than 150 people searching with probes in rock-hard avalanche debris. 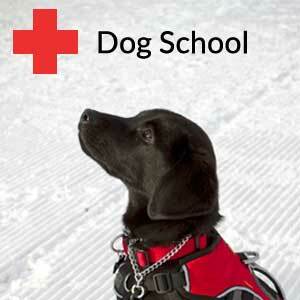 WBR now has over 100 volunteers and more than 30 highly trained rescue dogs. The men, women and dogs who make up these rescue teams volunteer, day and night, devote countless hours, testing and training, all in the hopes of being part of a successful rescue. 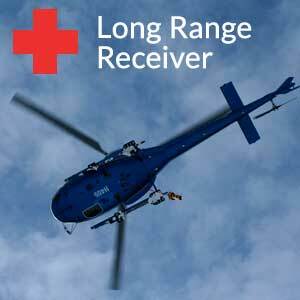 The goal of each rescue team- to make a live recovery- is very difficult. It takes precious time to mobilize once the call comes in. Few recoveries have a totally positive outcome. As rescuers, we try to look at the bright side of each situation and are proud of the job we do, every time. If our team worked hard and responded quickly, we are doing our job. WBR then looks toward educating backcountry users on making wise decisions when traveling in the mountains. We have taught many courses on safe winter travel, snow pack evaluation, and self rescue, in hopes of being pro-active in saving lives. WBR also spends a lot of time training and testing dog teams, to uphold a high standard of professionalism in every situation. We have hosted numerous rescue dog training schools and have had the opportunity to train dog teams from all over the western states, Canada, and Europe. WBR will continue to provide this service to the general public in hopes of making a difference, and maybe even save a life while doing it. It’s hard to describe the feeling you get when working with this group. It’s a great sense of pride in the dogs and the people that make up the Wasatch Backcountry Rescue.